Tight end Jonnu Smith (#87) ranks No. 4 all-time in career receptions, No. 5 in career receiving yards and No. 3 in career receiving touchdowns in the FIU record books. He is the first Panther to be selected in the NFL Draft since 2013. Arguably the best tight end in FIU’s history will be making the switch from the Magic City to the Music City. Jonnu Smith, who set FIU football records for career receiving yards (2,001) and career receptions (178) by a tight end, was drafted in the third round of the 2017 NFL Draft with the 100th overall pick by the Tennessee Titans on April 28. Smith becomes the seventh Panther to be selected in the NFL Draft. Only Johnathan Cyprien (selected 33rd overall in the second round of the 2013 NFL draft by the Jacksonville Jaguars) and T.Y. Hilton (selected 92nd overall in the third round of the 2012 NFL draft by the Indianapolis Colts) were drafted higher than Smith. Smith and Cyprien, who signed a four-year deal with the Titans in March, will be playing together this upcoming season. It was an exciting moment for Smith, joining a Titans draft class loaded with potential offensive weapons for third-year quarterback Marcus Mariota. The 6-2, 248-pound tight end finished his FIU career last fall with 506 receiving yards and four touchdowns on 42 receptions and impressed scouts during the 2017 NFL Combine, boosting his draft stock. 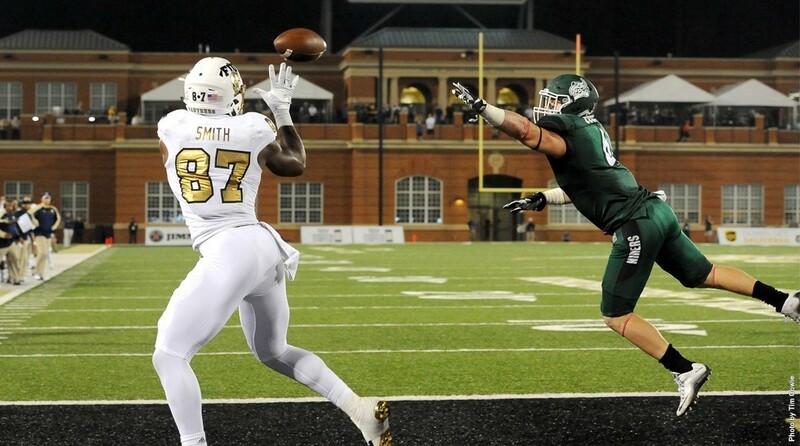 Smith has drawn comparisons to current Titans tight end Delanie Walker for his athleticism and speed.